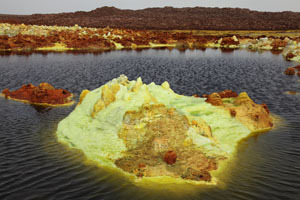 Dallol volcano is located in the Danakil Depression in NE Ethiopia, in a remote area subject to the highest average temperatures on the planet. 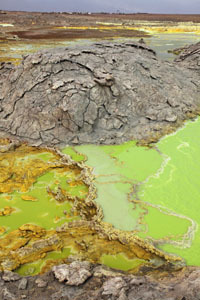 The volcano encompasses Dallol mountain (which rises 50-60m above the surrounding salt plains and has approximate dimensions of 1.5 x 3 km) and several other features in the vicinity, such as the 1926 crater near the "Black Mountain" about 1.5 km to the SW. Dallol is nested on top of an at least 1000m thick layer of quaternary evaporates including large potash (potassium salt) reserves, the source of which will be discussed in more detail below. 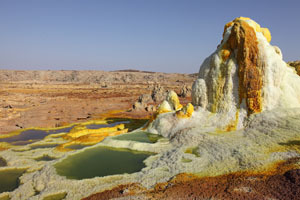 Dallol mountain is thought to have been formed as the result of intrusion of a basaltic magma body underneath. 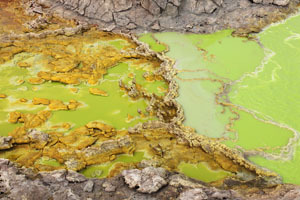 The circular depression near the center of Dallol mountain is presumably a collapse crater, although neither its age nor the exact process from which it resulted are known. The SW flank of Dallol mountain harbours impressive salt canyons formed by erosion processes. According to the french volcano guide Guy de Saint-Cyr, on January 2-3, 2015, local eyewitnesses described what appears to have been an ash plume over Dallol and incandescence at night. If this is confirmed it would represent the first magmatic eruption at Dallol in historical times. In fact, no geological evidence for any previous magmatic activity at Dallol has been reported, making this a significant event. 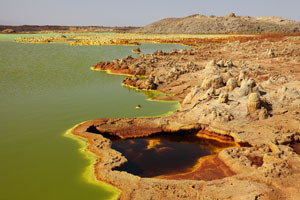 The Danakil Depression is located in what is effectively a northerly extension of the East African Rift Zone. 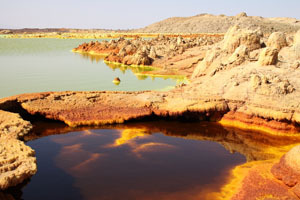 It lies in the gap resulting from gradual separation of the Danakil horst from the Ethiopian Plateau. Since the area lies up to 120m below sea level, it has been repeatedly flooded when the ongoing rifting process allowed transient entry of waters from the Red Sea. It appears that the area was last separated from the Red Sea around 30000 years ago when volcanic activity to the north in the vicinity of the Gulf of Zula again created a barrier to sea entry (Bonatti et al., Science 172, p.468-469 (1971)). Following each flooding episode, partial or complete evaporation of the sea-water resulted in thick deposits of salt. These deposits are highly stratified, since when large bodies of salt water evaporate, precipitation of carbonate, sulphate and chloride salts of sodium, calcium, magnesium and potassium occurs at different stages of the evaporation process. 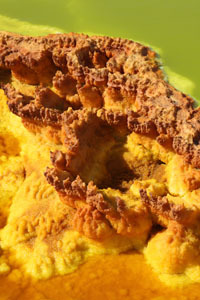 The deposits in the Dallol area include significant bodies of potash in the form of Sylvite (KCl), Carnallite (MgCl2-KCl-6H2O) and Kainite (MgSO4-KCl-11/4H20). The main sylvite-bearing zones are between 15 and 40m in thickness. The potash deposits cannot be accounted for by simple evaporation of sea-water, but are thought to result from rising of hydrothermal brines into the overlying sea-water during the evaporation process (Hardie, Ann. Rev. Earth Planet. Sci. 1991, p.131-168). 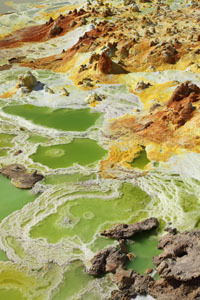 Geothermal / volcanic activity is indeed common in continental extension basins such as the Danakil Depression and is further evidenced by the volcanic chains in the area which include the active Erta Ale volcano. The geographical location of the main "Musley" sylvite strata W of Dallol at the base of the highlands, and fact that it overlays the carnallite strata, suggests that it was produced by selective leaching of MgCl2 from carnallite by run-off waters from these highlands and by deliquescence (Holwerda and Hutchinson, Econ. Geol. 63, p.124-150 (1968). The primary (i.e. 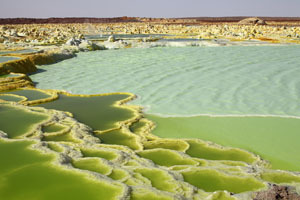 sedimentary) potash deposits in the Dallol area are usually overlain with other evaporates, and the entire area around Dallol is covered at the surface by alternating layers of halite and mud to a depth of several meters. This "crust" results from the periodic flooding of the area by sediment-rich waters from the nearby highlands and subsequent dessication. South of Dallol, the crust is cut into rectangular slabs and transported up into the highlands a near endless procession of camel caravans. These slabs are later sold in Mekele for processing into common salt. Slabs of halite cut out of surface crust. 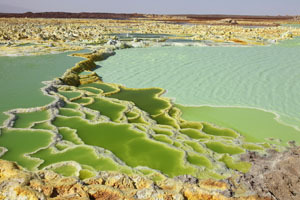 Dallol is one of the few places where potash deposits are found at the surface. These are brought to the surface by geothermally heated groundwater and can form large secondary deposits as the water that transported them evaporates. It was once estimated that a spring in the Black Mountain area was bringing around 1000 Tonnes of potash to the surface in a single year. 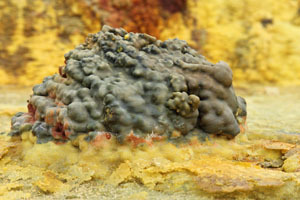 Whilst pure sylvite, karnalite and kainite and of course halite (NaCl) are relatively colourless, inclusion of various ions in the salt crystals is responsible for the variety of colours encountered in the Dallol area which are in stark contrast to the predominantly white halite crust found in most of the depression. The Black Mountain consists of manganese-rich halite. 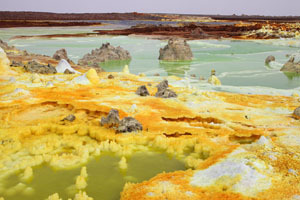 The colourful springs on Dallol mountain derive their colours mainly from ferrous chloride and iron hydroxide (both white-greenish), ferric chloride (yellow-brown) and iron oxide (brown). 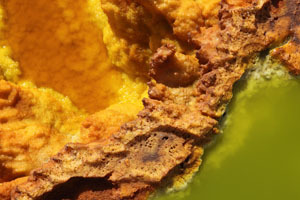 The active springs are usually white or yellow, whilst older inactive springs end up rust-coloured as the result of ongoing oxidation processes. The iron may be derived from the underlying basaltic intrusion. 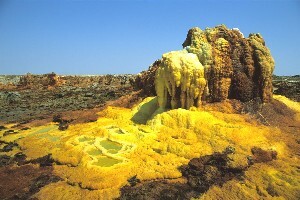 There are also numerous fields of fumaroles on Dallol Mountain. The fumaroles have low temperatures and only appear to emit little gas. The proportion of sulphurous gases appears to be quite low and the deposits formed are not crystalline sulphurs as in many fumarole fields. 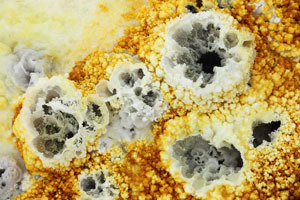 The formation of egg-like fumarolic deposit structures of white to yellowish colouration can be observed. It seems that these are made of thin layers of salts. 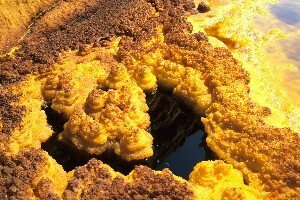 Egg-shaped fumarolic deposits, Dallol, 2008. The salt canyons in the SW flank of Dallol mountain are some of the most impressive geological features in the area. Salt pillars up to 40m high are found in these canyons and result from erosion of the uplifted areas. The pillars consist of hundreds of layers of slightly pinkish (due to low levels of KCl) halite (NaCl) salt deposits separated by thin layers of gypsum-like material. The pillars are capped by gypsum anhydrite and clay beds which protect them from rainfall-induced erosion. 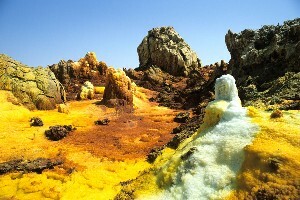 Several kilometers S of Dallol Mountain are further springs with beautiful colourations. 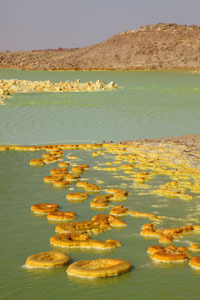 These included a lake with a diameter of 40-50m which contained yellow waters. 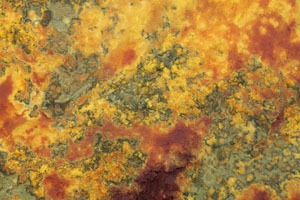 The surface looked blueish, yet at points of upwelling the yellow colour was visible, giving an unusual colour contrast. Several medium or small geysers were visible on islands in the lake or along its shoreline. The landscape in the area of these springs was coloured red, presumably by iron compounds. 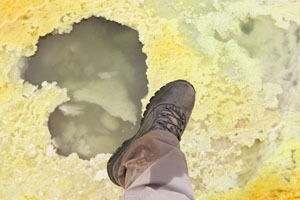 Geyser on island in "Yellow Lake"
Salt crust at side of spring near "Yellow Lake"
Tiny geyser at edge of "Yellow Lake"
Potash is of economic value as fertilizer component. Consequently, the recognition of surface deposits of carnallite by the Black Mountains in 1906, by the Italian T. Pastori, was soon followed by first extraction attempts. The Italian Compagnia Mineraria Coloniale (CMC) installed mining infrastructure at Dallol. 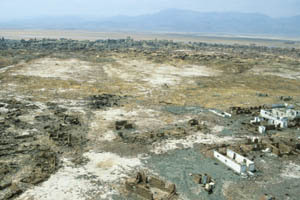 The main settlement appears to have been on Dallol mountain (presumably to avoid flooding during the rainy season). Transport was initially by camel all the way to the coast. However, from 1917-1918, CMC constructed a 60cm-gauge Decauville railway (Decauville = ready-made sections of small-gauge track which can be rapidly assembled) which served to transport the salt from the "Iron Point" rail terminal near Dallol, via Kululli just over the border, to the small Eritrean port of Mersa Fatma (Nesbitt, 1935. "Hell-Hole of Creation - The Exploration of Abyssinian Danakil"). From here the salts were shipped by dhows to the deep water port of Massawa, where they were then loaded onto larger ships for export. At Dallol, lorries were used to transport the potash for the few km to the Iron Point rail terminal. 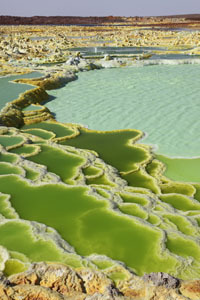 During WW I, the allies obtained much of their potash from Dallol (Holmes, Geol. Mag. 6, p.340-343 (1919)). One source (Guida dell' Africa Orientale, Consociazone Turistica Italiana, Milano, 1938) indicates that in 1918, 20000 tonnes of potash analog were extracted and sold to Stassfurt Salt in germany. This seems rather unlikely since the germans were not short of potash at the time and were at war with the allies till near the end of that year. 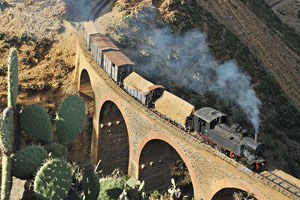 More details on the Mersa Fatma to Kolulli line can be found in the chapter on "Eritrea's Industrial Railways" in "Red Sea Railway - The History of the Railways in Eritrea" (J. Street & A. Ghebreselassie, 2009). According to the book, construction on the line started as early as 1905 and when it became operable in 1918, the line extended a total of 74 km from Mersa Fatma to Punta del Ferro (Iron Point), which was 9.5km beyond Kolulli. Hence, the line would have extended into Ethiopian territory and only about 10km of transport by lorry would have been necessary. The line was probably suspended in 1929, after which it was briefly reopened in 1939. 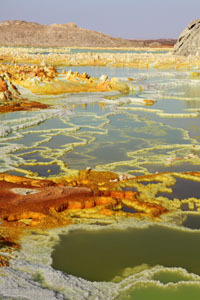 It is at this time that it was possibly extended to Dallol. It is rumored that the track was eventually dismantled and shipped to India by British troops during WW II (Luigi Cantamessa, pers. comm.). The locomotives used on the line were 0-4-0 side tank engines, with 5 manufactured in 1885-1887 by Couillet in Petit Bourg and an additional 3 being Porter locs built in Pittsburgh between 1900 and 1919. The locomotives would have pulled a number of simple tipper trucks. 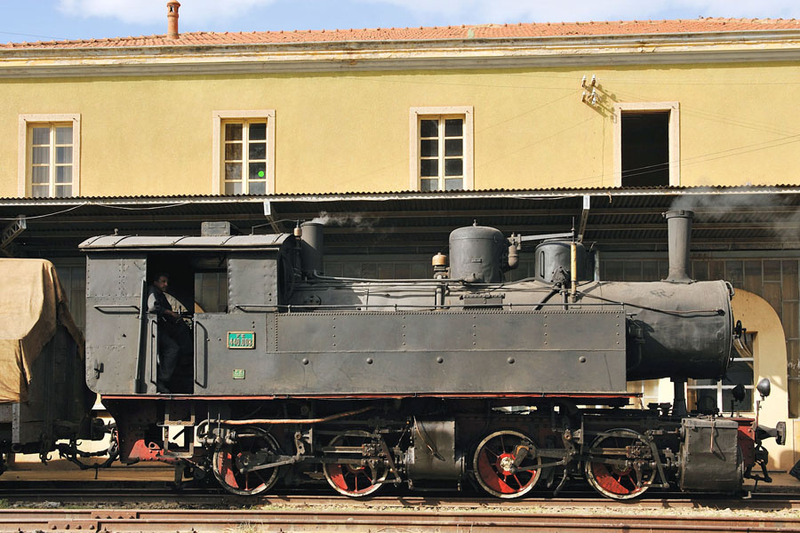 The locomotive boiler whose remains are found at Dallol was from a 4-4-0 type loc which was probably never used on the line. Its boiler was possibly moved to Dallol after it had ended its service life and was only suitable for static lower pressure work at the potash mine at Dallol. The actual mining initially took place at the carnallite / sylvite deposit by the Black Mountain and involved, amongst other techniques, flooding of salt pans around a continuously flowing hot spring and harvesting of potash-rich salts therefrom after deliquescence removed most of the MgCl2 (Holwerda and Hutchinson, 1958). It is questionable if mining was restricted to the Black Mountain area. 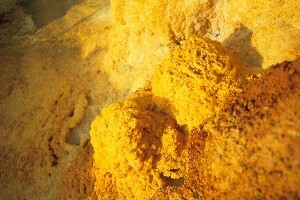 Apparently, local Afars tell of a deep mine that was present on Dallol Mountain in the vicinity of the mining village (L.C., personal communication). No entrance to a deep mine is visible today. However, what appear to be the axles of mining cars which may have been from a narrow-gauge railway (probably however not from the Kolulli-Mersa Fatma line) are found in Dallol village. On the other hand, the idea of deep-mining in an active geothermal area seems problematic. The mine(s) appear to have been operational until 1929 when operations ceased due to increasing tensions between Italy and Ethiopia and due to easier availability of potash from the US, USSR and Germany. About 70000 tonnes of potash were recovered during the period up to 1929. Between 1925 and 1929, 25000 tonnes were extracted (Mohr, Geology 1961, p.239-240). 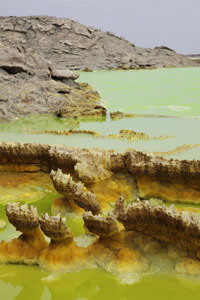 It is presently unclear what happened at Dallol in 1930s and particularly following its brief reopening in 1939. It appears that the mine was not totally abandoned after 1939 since there was a nearby military camp and Italian troops from the camp are reported to have sabotaged the mine before British soldiers arrived in 1941. Further, the US Bureau of Mines Annual Report of 1940 included reference to mining of salts at Dallol in 1940. Plans to extend a railway all the way to Dallol had apparently been made (this may have indeed occurred in 1939), especially after Italy conquered Ethiopia in 1936 and formed Africa Orientale Italiana, which encompassed both Ethiopia and Eritrea). Although the mining infrastructure was sabotaged (this possibly accounting for the lack of a visible mine entrance today), the remains of many of the buildings still remain. This includes remnants of workers dwellings, the walls of which were constructed using blocks of salt. Boiler of old 440 class locomotive. Maybe used to power mine machinery ? 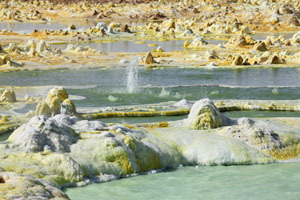 Boilers of unknown function with Dallol Mountain crater behind. Recent image of last running Mallet locomotive of 440 class (number 440 008). Boiler above is from same class. Photo kindly provided by Bernd Seiler of FarRail Tours. 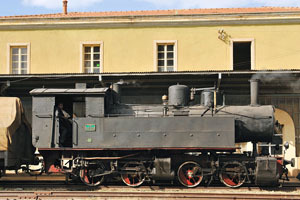 Mallet 440-008 locomotive on Eritrean Railway line. Fabrication number 1162/1915. Manufactured in Italy by Ansaldo. Photo kindly provided by Bernd Seiler of FarRail Tours. Salt-block building with later additions of modern building materials. After WW II, the Dallol Potash, Magnesium and Sulphur Mines, Ethiopian Company, Ltd acquired concession rights in 1949. The potash deposits (presumably near the Black Mountain) and nearby mixed deposits of sulphur and salt were mined. 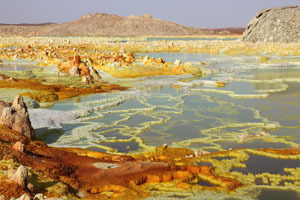 Other reports mention that the newly formed Dallol Co. of Asmara sold several tons of potash to India during the 1951-1953 period. How these companies relate to eachother is currently unclear. The mining was undoubtedly on a small scale during this period. The Black Mountain potash deposits caught the attention of the US Ralph M. Parsons company in 1954 (Holwerda and Hutchinson, 1968). A concession linked to obligations to investigate the deposits in the area was obtained. The company set up its base on Dallol mountain at the site previously occupied by the Italian mining community (modification and reuse of older buildings is evident) and constructed airstrips on Dallol mountain and in the Musley area. Over 300 holes were drilled to explore the location of the potash beds. This led to the delineation of the small localized "Crescent" carnallitite deposit in the vicinity of the black mountain during drilling operations in 1959-1961, and in particular to the discovery of the huge (>80 Million Tonnes) "Musley" sylvite deposit near the base of the Ethiopian Highlands, some 5km W of Dallol, and extending at least 10km in a N-S orientation. A 92m vertical shaft and a total of 805m of drives were made in this deposit, yet all work was stopped in 1967 after rapid influx of water into the mine killed a number of workers. The political tensions in the area at the time probably also played a part in prevented mining activity in the following years. 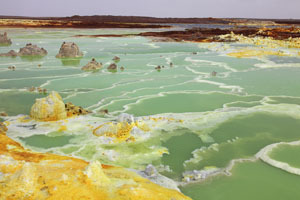 In 1997, Norsk Hydro A/S aquired exclusive rights to the Dallol deposit. However, the Ethiopian-Eritrean war of 1998-2000 and continuing tensions meant that no mining operation was actually established. The license was consequently revoked by the Ethiopian Ministry of Mines and Energy (MME). In Dec. 2007, the Indian company Sainik Coal Mining Pvt. 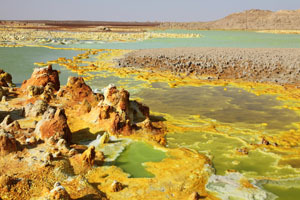 Ltd. signed an agreement with the MME in which a license was granted to mine potash in three areas, one of which appears to encompass the Dallol geothermal area. The company intends to mine approx. 1 Million tonnes of Potash per year by solution mining. This involves pumping water to the most potash-rich layers in order to dissolve potash therein, pumping the salt-rich solution to the surface and evaporating the water in salt pans to obtain the potash. 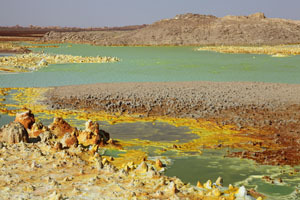 The high temperatures in the Dallol region facilitate such a form of mining although its efficacy will depend on the ability to selectively dissolve the targetted potash horizons as opposed to the surrounding rock salts. Whilst by 2011 there appeared to be no plans to extract Potash from the mound, it remains to be seen if operations will be expanded in the future and also if geothermal activity at Dallol will be affected. At present, Sainik is focussing largely on the historic Musley Deposit. 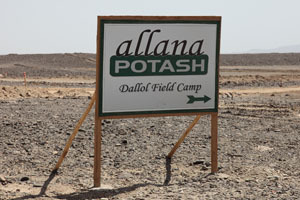 Allana Potash (Canada) is assessing the deposits nearby in their about 150 sq. km concession which surrounds those of Sainik, whilst BHP Billiton owns large concessions further south and to the east. Immediately north of the Eritrean border, Southern Boulder Mines Ltd. owns a 906 sq. km concession. Due to the border conflict with Eritrea, it is planned to transport potash extracted from the Ethiopian concessions by road to Djibouti port, from where it will be exported. 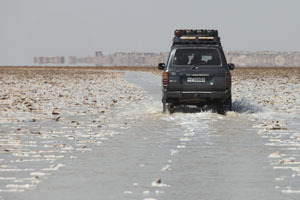 A road from Dallol to Afdera (150km to the South) is planned, and Afdera was recently connected to the main road to Djibouti. The road from Mekele to Hamedale (near Dallol) is also being surfaced in the near future as it constitutes an important supply route. 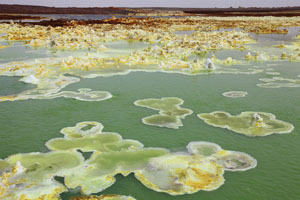 In early 2011, heavy rainfall in the preceding months led to increased water input into the hydrothermal system at Dallol. A similar situation was previously observed in 2005. 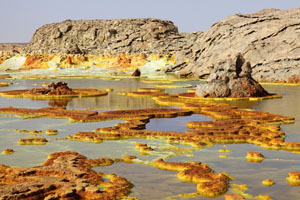 The result was extensive filling of the central depression in Dallol with hydrothermal waters. The area covered by active springs was also far more extensive than in normal years and the temperature of many of the springs appeared unusually high with several areas steaming or degassing strongly. Minor geysering activity could be observed in places. Further, one area had a large number of dark green hydrothermal deposits which I had not seen during previous visits. The images below were all taken in late January 2011. 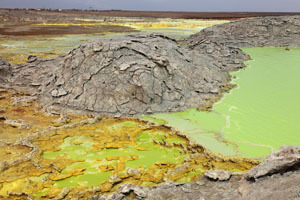 The beautiful hot springs at Dallol are attracting increasing numbers of tourists, with many tour operators organizing tours into the Danakil Depression to see the Springs and Erta Ale volcano further south. 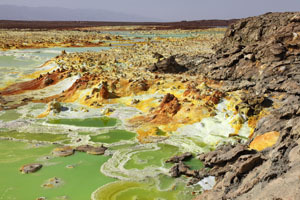 Dallol can presently be reached by 4WD vehicle in 1 day from Mekele and 2 days from the main Addis-Djibouti road. However, 2007 and 2008 have seen repeated attacks on tourist convoys by what appear to be Afar Separatists from the Afar Revolutionary Democratic Unity Front (ARDUF). The establishment of improved infrastructure is gradually increasing security, yet even the current small but rapidly increasing stream of tourists is causing visible damage to the fine structures in the geothermal area.